Brown chicken in butter and season with salt and pepper. 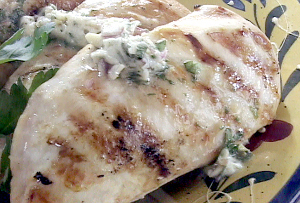 Remove chicken from pan and add cream cheese in cubes with butter and drippings from chicken. Add cream, lime juice and cilantro. On medium heat, stir all ingredients until melted. Put chicken back in sauce mixture. Cover and cook on low 15 minutes, until chicken is done.